I realize that this isn't "Android Tablet" specific news but it's definitely closely related.... kissing cousins or so. 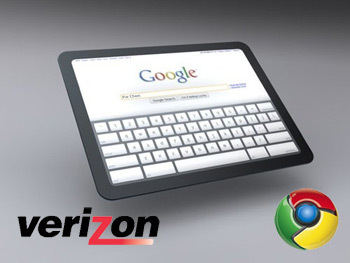 Rumors are floating around that Google will release a tablet device running Chrome OS and operating on the Verizon Wireless network sometime around November 26th. Pricing is being mentioned that puts the device at..... Free. With purchase of data contract that is. How can they do this? I can only suspect that they don't mind not really turning any type of profit on the hardware and instead intend to make it all up on contract payments and monthly revenue kickbacks from Verizon. Why would they do this? Well, we all know that it's a warzone out there: mainly between Google and Apple, and this is certainly a great way for Google to steal some of Apple's thunder and steal market share. Offer a competing product at an unbeatable price. The hardware is rumored to be Nvidia Tegra 2 based, 1280x720 multitouch display, 2GB RAM, 32 GB SSD (not very likely in our opinions) Wifi/Bluetooth and 3G Connectivity. Another baseless rumor? Possibly, but given that we do know Verizon will be released a couple of tablets soon it might just have a possibility. Here's to hoping! This is a failure waiting to happen. Just try booting the LiveCD/LiveUSB.